Extraordinary Means is a contemporary novel by Robyn Schnyder. I, however, had not heard of this book until this tag, done by the lovely Stevie over at SableCaught and I was tagged by Jeremy from Inklingstime. This tag is all about how far we would go for our dearly beloved books.. Let’s see for which books I would go to extraordinary means. No internet for a month, that’s quite a long time.. Luckily I have enough series and books to cover being away from the internet for a whole month. The truth is, however, I don’t care much about first editions and all, seeing as I try to go for the mass market editions as much as possible – yes, I’m cheap.. But if I have to give up the internet after all, it’d better be a book that I hold dear. So preferably a Robin Hobb, or Audrey Niffenegger’s The Time Traveler’s Wife, which is still one of my favourite books to date. If I had gotten asked this question little over a year ago, I would not have given up pizza for a year. But since the best pizza place has gone out of business and any other in the remote area can’t compare, this is no longer an issue. 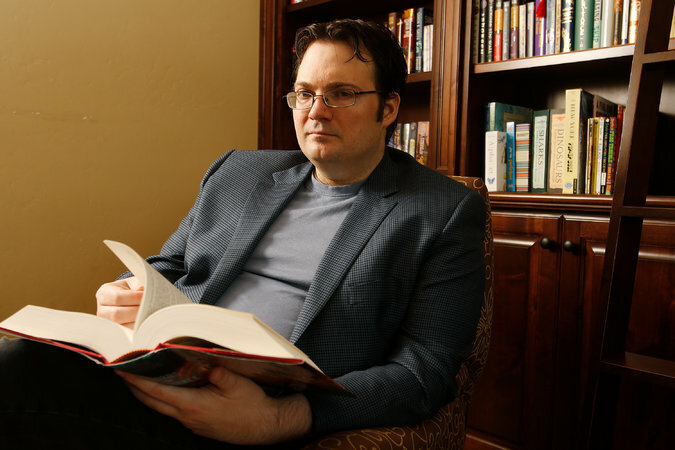 I would stop eating pizza for a year if it meant sitting next to Brandon Sanderson for a long plane ride. The man has the richest imagination possible and I would love to listen to him talk about his crazy idead for new world and amazing magic systems. And if possible, he can always read some teasers from his up and coming books..
3. I would sit through a thousand hours of commercials if it would ensure that Hollywood made this book into a movie. But I hate commercials! With a passion.. Especially when they’re conveniently timed and leave you hanging from a cliff.. Also, while in my wildest dreams, all the books I read have some live action adaptation, I’ve seen enough of them to know that disappointment is a real thing. I just like the movies in my head better. I would love to see an adaptation of Robin Hobb’s Realm Of The Elderlings series for tv. It has the potential to be one of those series where not a lot happens in one episode, but you’re still swept away by the court intrigue and the atmosphere of it all. And then, as the season progresses, the tension rises and you can’t live without those characters you’ve grown fond of and the finale leaves you in pieces on the couch. Cue commercials. For tissues. Never again reading a new book? Is this a tag or the script of the newest horror flick? Seriously.. Living inside a book also seems a pretty dangerous endeavour. I mean, unless you choose a contemporary romance or something along those lines, you’re pretty much destined to be confronted with conflict, war, destruction, … All the while you could have been snuggling up with a book and a hot cup of tea. But then again, who wouldn’t want to live inside the Harry Potter novels? Preferably after the Second Wizarding War and Hogwarts has been rebuilt. But I don’t want to be too demanding.Or Discworld! Yes, I would love to live on Discworld! I can’t think of anyone who wouldn’t have the time of their lives on that crazy world. The cities, and the people, and the craziness.. Hold on while I book my flight! This would probably be the most boring history in the history of internet histories.. But if it means I can call J.K. Rowling by BFF, by all means, print it in tomorrow’s papers! Although I guess Rowling is a pretty popular choice and thus she wouldn’t have a lot of time for me personally, so I also would make my search history public for Patrick Ness. He comes across as a very charming man and I really like his voice. Ooh, our cats can be BFF’s as well! Almost every tag has a question like this, and I never know what to answer. I don’t really read books to find potential fictional boyfriends nor do I swoon over characters. But for the sake of it, I wouldn’t mind dating Chaol from Sarah J. Maas’s Throne Of Glass series. I would not want to give up everything I own, for anyone, but he’s working for the king and money is at hand, so losses are minimal, no? Also, this comes with a but. And the but is: I am currently reading Crown Of Midnight, so if Chaol turns out to be a douche in books three and four, I’m not dating that Chaol. I’m dating mine. Just to be clear. And there you have it. For these books/authors I would go the extra mile. If you like this tag, consider yourself tagged. I tag Jesse, Joey, Panda, Ariana, Anette and Ana. Oooh! Looks like fun. Thanks for the tag! !